Some might have seen this error before and the reason is quite simple. The installed Data-Tier Application Framework version and SQL Server Data Tools do not match the ones required by the database. And everything is working fine again. Today I was working on some data integration issues and was creating a BDC model. So as always, I created the model, added a finder method and modeled my entity. Then I deployed the solution and tried to creating an external list to test my finder method. 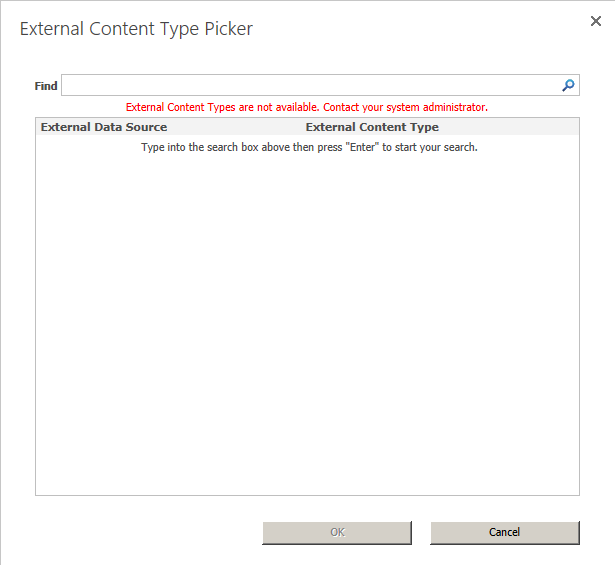 So far so good, but when opening the External Content Type Picker the following error appeared: External Content Types are not available. Contact your system administrator. What is that? Did my deployment fail? I opened the BCS service application to check if the model was correctly deployed. But it was there. My next idea was that something with the permissions was wrong, but everything was as usual. So, what could be wrong? After a few minutes of staring onto the BDC model, I discovered it. My model was simply missing the specific finder method. After adding it, the external content type appeared in the picker. So, lesson learned for today: always add finder and specific finder method before deploying the model. The default web application could not be determined. And that was it. The installation went without problems. For sure you have to replace ‘http://sharepoint’ with the url of your SharePoint. IT is a people’s business.